Very amazing stories sometimes come my way, and this one must be shared. Don Hardy (an artist, creator, and curious man!) 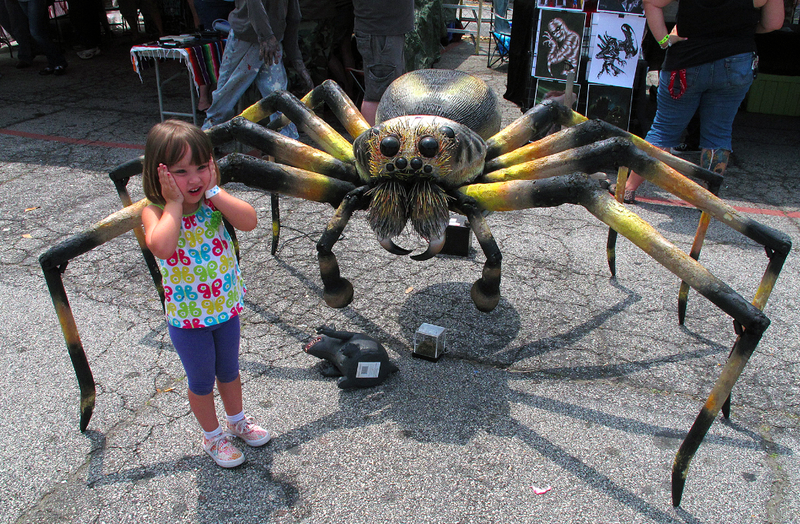 approached me with a story and photographs of a 9 foot spider sculpture that he made. Don found me because of the spider bite story that came out a few weeks ago, and he and I immediately developed a rapport despite the fact that we live in different countries, and have different training (me, trained as a scientist; Don, trained as an artist). What do we share? 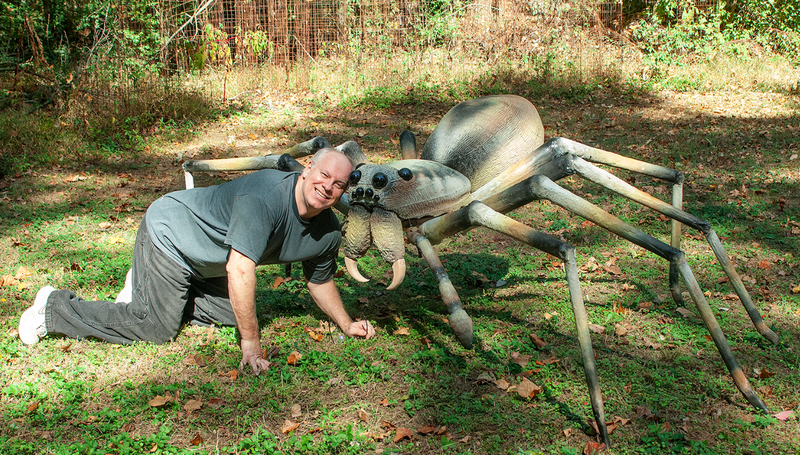 A love of spiders: a love of their elaborate and unique anatomy, the way they move, and the way they have such an important place in our society – whether it be via adoration, fascination or terror. So, let’s get right to the good stuff. Here’s what Don created. I am simply amazed and astounded by this beautiful creation! I asked Don to provide me a few detail about the story behind his piece of art. Here are some exerts from his story, and Don has kindly given me permission to post this story, and his photographs. I wanted to build a model of a spider for many years. The existing models and toys that I have seen were not real enough for me to appreciate so I decided to build my own version of a spider model. I studied many varieties of spiders and decided to use a combination of huntsman and wolf spider for my project. The initial inspiration was a huntsman spider due to an interesting experience I had at a pawn shop a couple of years ago. I was in the market for an electric piano and found one at a local pawnshop here in the Atlanta area. It was a Kawai model 330 missing the legs so I got a deal on it for 200 dollars! I brought it home and noticed that it had outputs for external speakers so I didn’t need to use the internal speakers at all. I could hook it up to my larger amp and get a bigger sound. I decided to take the internal speakers out and use them for another project later on. As I was taking one of the speakers out a large Huntsman spider came out of the hole! You can imagine how alarmed I was! I admit I jumped a little bit but soon relaxed after I noticed it was dead and dried up. I put it up and started to take out the second speaker. Another large Huntsman fell out of the second speakers hole! An unlikely duet! I put it up and continued to set up the piano for my other amp. The piano worked just fine. It gave me two giant huntsman spiders to contemplate! I used approx. 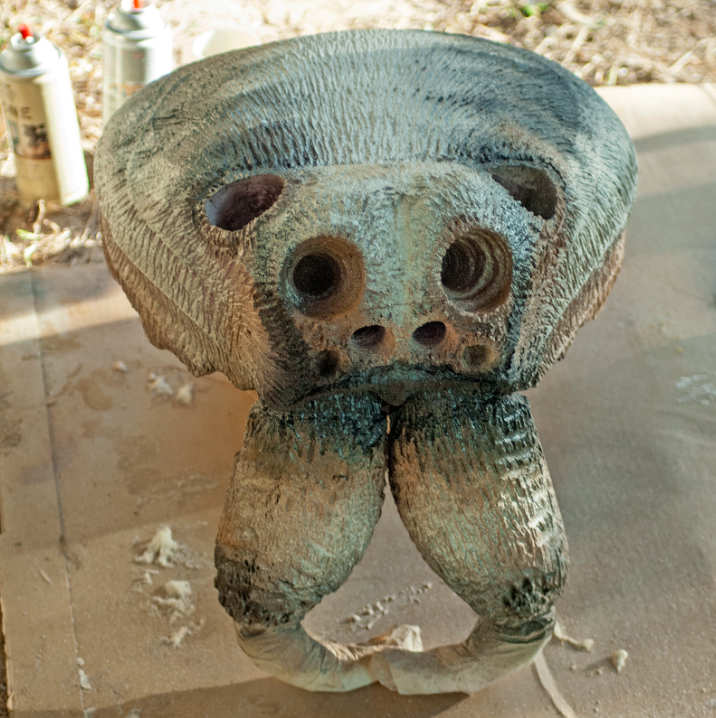 a 40:1 ratio which would make my sculpture about 9 feet across with its legs fully extended. I made probably 20 trips to the local home improvement store and spent about 2 months working in the basement measuring, sawing, gluing, carving and bolting together the various boards, etc. 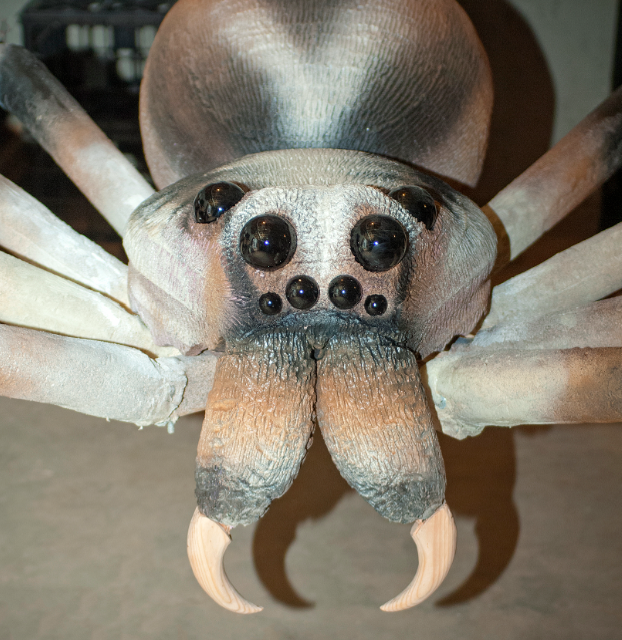 that would replicate a spiders legs, pedipalps, fangs, sternum, cephalothorax and abdomen. I made templates for the eyes, fangs and abdomen. This helped with symmetry, size relationships and outlines for cutting. I also added heavy duty springs for leg tension so it could be self supporting. I decided to go with a wolf spiders face which looked more interesting and fearsome to me. The wolfspiders eyes were much bigger and menacing than the huntsmans. And the anatomy was similar enough to switch over to a wolfspiders face without much difficulty. Once the basic structure was completed I started studying many images of huntsman and wolf spiders to paint a pattern on top. I probably used about 20 cans of spray paint before I was satisfied with the pattern. I used some artistic license but still stayed true to basic patterns. These spiders are masters of camouflage and the coloration and patterns blend in perfectly with grasses and terrain. Halloween was fast approaching and I was able to display it in my neighbors yard. Amazingly some of the smaller children were crying and running from it thinking it was real! At first I built it as a static sculpture without any plans for further development. As I started studying what I created I realized that there was plenty of room for adding wires, motors and cables to make the fangs move, the pedipalps swing up and down and the abdomen to swing back and forth. Back to the workshop to add additional lifeforce! After drilling and a few more trips to the home improvement store I had a spider that had fangs that moved, pedipalps that swung in and out and an abdomen that shook back and forth! Don and his spider friend. Now it must surely be finished? It stayed this way for about a year and then I realized I could make the two front legs raise up and down if I installed an actuator and cables on the sternum. I even went a step further and added servos and switches to the actuator and everything else so I could operate all the moving parts with a wireless transmitter! I purchased a Futaba four channel transmitter and four servos. I attached the servos to the sternum carefully lining up the wires and rods. After much tweaking I got it working quite well. 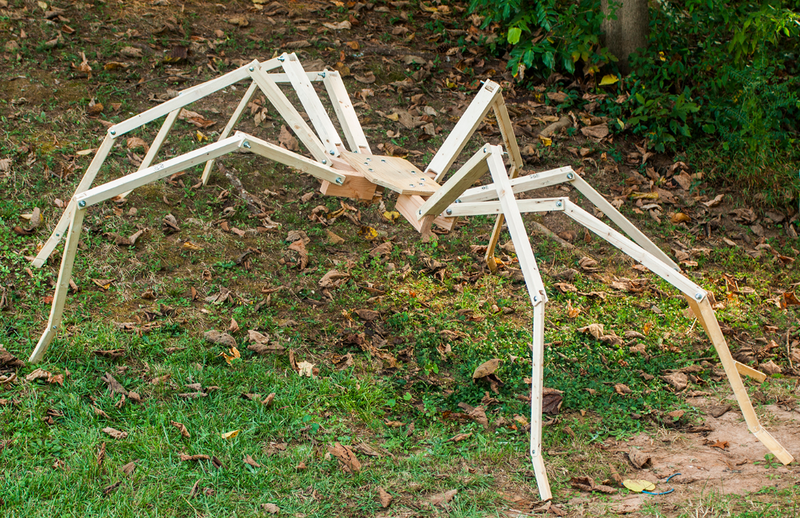 The dream had of building a giant mechanical spider was finally coming true! In summary, I sincerely thank Don for doing this incredible project, and also being keen to share it with the world. His work is a wonderful union of science and art. To see some of Don’s other work, you can visit this site. I would like to show my affection for your kind-heartedness for men who should have assistance with that niche. Your special dedication to getting the solution throughout had been definitely productive and has in most cases helped many people like me to reach their ambitions. Your insightful instruction can mean this much to me and even more to my office workers. Thank you; from all of us. Thank you! With Halloween fast approaching I’m sure it’ll get some attention!